My day has arrived for the My Happy Place Rowalong, hosted by Marian of Seams to be Sew! And here is my current happy place - In the Swimming Pool! Yes, hard to imagine that anything involving exercise could be a happy place, but after 25 years of swimming with the Stanford Masters program, I'm happy that I'm still there. You see, 30 years ago, I was treated for Hodgkin's lymphoma, and upon approaching the five year mark, I decided I needed to commit to a life of exercise. Having grown up on a lake, swimming was a natural fit, especially since it could be done year round in CA. Fast forward to two years ago. After so many years of swimming, I started having neck/shoulder issues, and sought physical therapy. Turns out, I wasn't using the right muscles to swim, causing pain and numbness. Now I'm on a mission to change my stroke, and build up the proper muscles in my back. It hasn't been easy, but I'm getting there, and I find that I really enjoy swimming again. Of course, with a Master's workout, I can also let the diet go a bit - I just work harder to burn off any extra calorie intake! So, yes, in the swimming pool is my happy place. and this is what it really looks like. Using Kona Cotton Solids to add a few lane lines and an applique swimmer, and this row is complete! 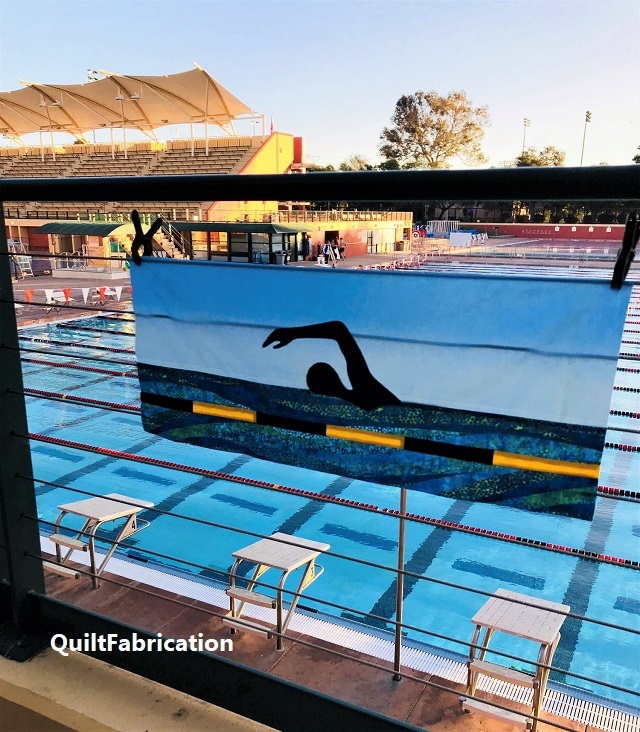 The In the Swimming Pool row pattern is free at Craftsy thru September 24, 2018 - get it while you can! 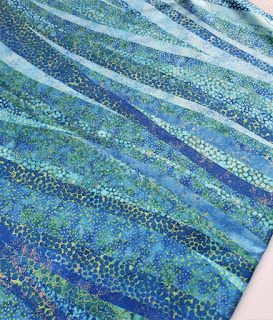 Notice I haven't quilted my row - plans may involve it becoming part of a larger swimming themed quilt - we shall see. And a big thank you to Marian of Seams to be Sew for orgainizing this yearly rowalong! Another big thank you to the wonderful sponsors who have donated these fabulous prizes! 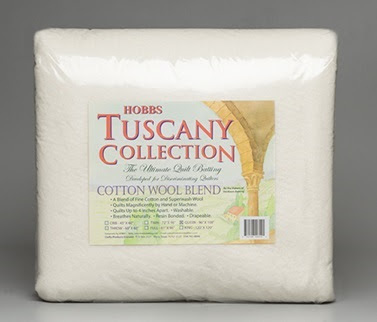 Enter via Rafflecopter to win a package of Hobbs Tuscany Cotton/Wool - Throw size, approximate value $16, with worldwide shipping via Hobbs. Giveaway ends Sept 25, 2018. 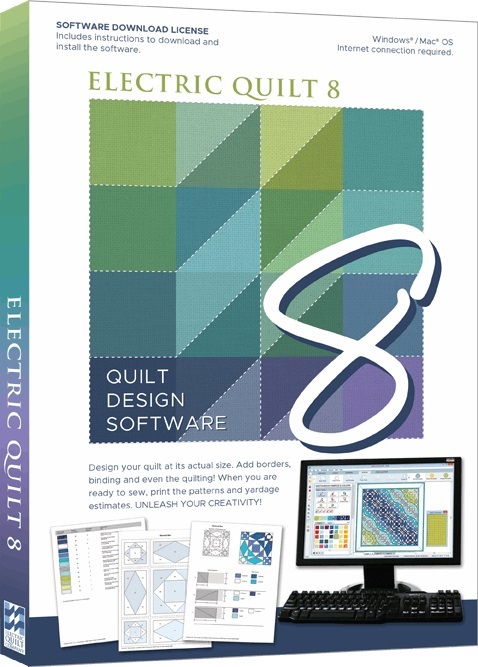 But we're not finished yet - enter to win Electric Quilt version 8 quilting software, a $239.95 value! 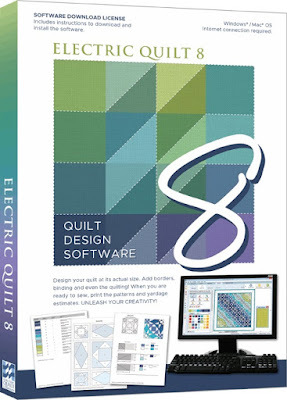 I have used EQ since version 6, and find it extremely helpful in designing quilts - and you will too! Prize will be delivered via email as a coupon code to use at purchase. For the complete rules of the rowalong, including a full list of designers, sponsors, plus giveaway entry rules, please visit Seams to be Sew, our wonderful hostess. still available as a free download on Craftsy. Enjoy the hop and good luck on the giveaways! 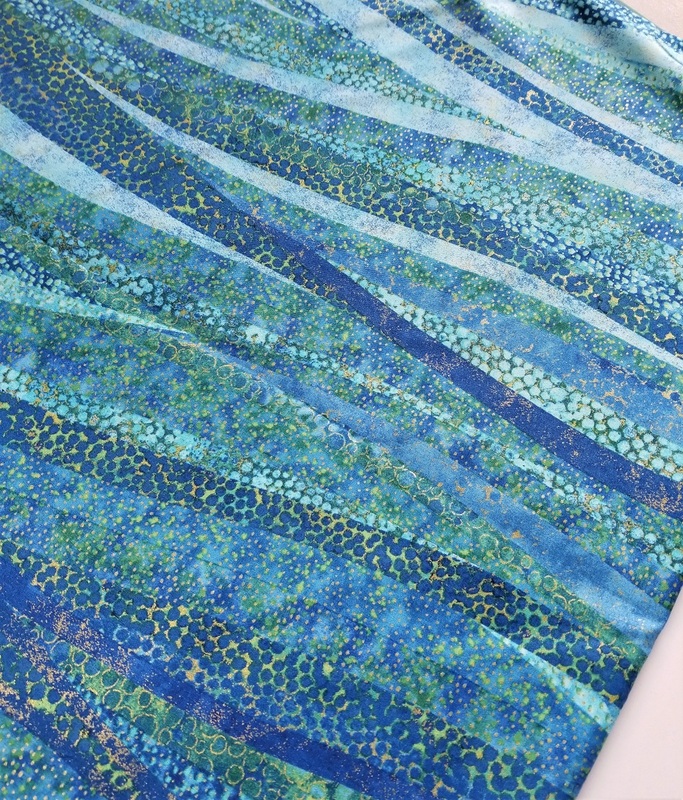 Wow, that water fabric from Northcott is amazing! It really makes the entire row shine! Great pattern, and thank you for sharing your story. Thank you for sharing your story and the wonderful row pattern with us, Susan. It is absolutely stunning. Your row is fantastic and the story behind it is inspiring! Doing things in pain is not fun, glad you are working through it and getting back to doing what you love. Very appropriate row for you. Beautiful row Susan and how awesome that you swim all the time! I love this row Susan, it's "sew" cool!!! The story behind is really makes it that much more special. I loved that you showed your other rows from previous years to, its great to have a nice reminder of that with your participation each year. Thank you for coming along for the ride again this year and perhaps you will consider the next also. Hugs!! Your swimming pool story is inspirational. I appreciate the pattern. Congratulations on your victory over Hodgkin's! I love swimming too. I hate exercise, but swimming just doesn't feel like exercise. Thank you for a very nice pattern. Thank you! Swimming is such an excellent all around form of exercise - probably why I've stuck with it. Love your swimming row, Susan. My favorite classes at the Y are in the water. This is such an inspirational story and an amazing triumph over Hodgkins! Your row is another beautiful creation that goes along with all the other incredible things you make. I love it! Carol - thank you so much for the awesome support! I got truly lucky with the Hodgkins - stage 1A - it could have been much worse. I love your row block - perfect reflection of your dedication to taking control of your body. And a great inspirational reminder for me to do the same. Thank you! Love the row and the story behind it! You're welcome! I'm thinking I might include this in a quilt with all four strokes - just need to work out the rest of the design. Oh my goodness, you are an inspiration. Congrats of your remission and commitment to keeping healthy. I used to swim daily when my kids were little. That was truly my happy time too! Thank you so much! I've been consistent at a minimum of 3x a week, at an hour each, for 25 years. And I hope to go for another 25! Mmmm, makes me want to take a dip in the pool! Beautiful row - just perfect for my niece who swims! This is so cool! And congratulations on being a swimmer. I love swimming and I have snagged the pattern. Thank you! Thank you! Enjoy all the others too! Terrific row! 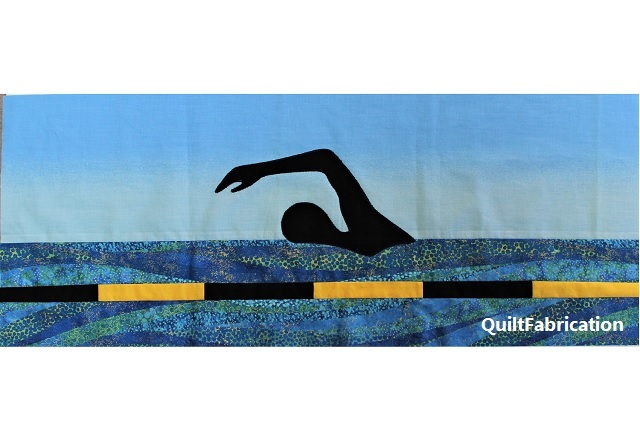 I too am a swimmer and every time I get in the pool I think "I need to do a pool/swimming quilt". Your swimmer appliqué is just perfect! Thanks for taking the time to create and share! Having grown up with a pool in our back yard, and taken many competitive swimming lessons, this row speaks to my heart. And I absolutely adore the photo location. Thank you for a fantastic row. That water fabric IS awesome, Susan!! My 9 year old granddaughter and 6 year old (almost 7) grandson are on the Y swim team. They love it and it really is a good work out for them. The other twin grandson is into karate. In fact, they both take karate. When they go to the Y for practice, the one also goes along and he swims, but has asthma and does not have the lung capacity for the team. Thanks for sharing your row. I think I may make them one! And, congratulations on being a SURVIVOR!! Your row is wonderful! Really captures the water. Thank you. What a neat quilt, and that fabric is perfect for water! I love the water fabric so calming. 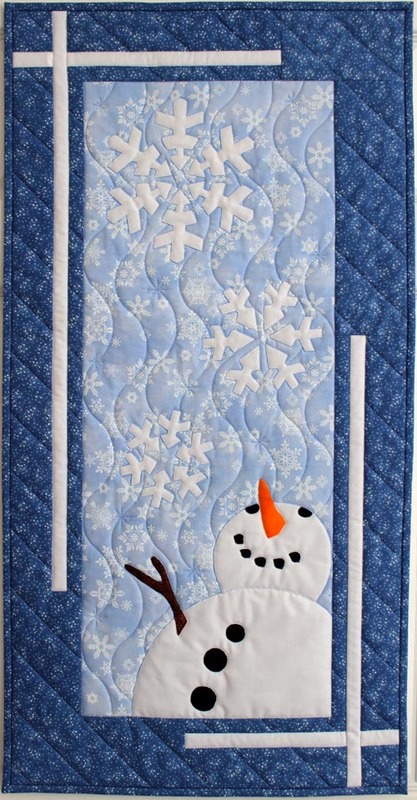 Cute quilt. You live in my old stomping grounds. I still miss the great weather and all of the wonderful activities around the Bay Area. I love your row. Thank you for the great pattern. I love to swim also. I just hit the 5 year marking after going through treatment for Large B cell lymphoma. Now I know what to do with some of the water fabric I have! Thanks for the pattern. Great row and inspirational story! Wow, I love this so much! My college roommate was a swimmer and just recently got back into it, I think she may need this! Thanks for a fun row! Your reminding me that I have to get back into water aerobics. Thanks for the adorabe row. That turned out so well. I LOVE that water fabric. Swimming is such great exercise. I'm sure your lymphoma treatments were no fun. Thanks! I don't really remember much - spent the time sleeping. Great row! I commend you for your commitment to swimming. Exercise is not always fun but it can become a way of life and it has it's benefits. Definitely is a way of life around here! Best water fabric I’ve ever seen and your row is genius! Wish I had your willpower! Beautifully uplifting row! Thank you! Oh how I wish I could swim, but never learned how. Now at almost 70, think it's a little late. Congratulations on getting back into that which you love so much. Thank you for a cute row and for sharing your time, your talent and your creativity. The fabric made row more realistic. Thank you for sweet row. I've never learned to swim but I understand its good exercise. Never too late to start, right? A very nice row. It is wonderful how we can find fabric to do most of the design work for us. Congratulations on your Master's program and your good health. It's so good to hear you're in good health after having Hodgkin's lymphoma. You're a survivor! Sew...you're a swimmer;-) What a great story. Swimming is the best sport isn't it. Your quilted swimmer has perfect form. This is an amazing row! Thank you for sharing your story. Your row is amazing--which is just what the commenter about me said, but there's really no other word for it. Especially after seeing the first photo--you could not have displayed it more perfectly. My niece just made the decision to quit the swim team and I'm so disappointed, if only because I wish I could make her this quilt row; she's a teen and if I did she'd think I was being snarky. I'll wait a decade and she'll view it as me commemorating a happy time in her life. I'm not a swimmer, but I admire your dedication. Your row reflects your happy place. I love this! Reminds me of my youth, when I spent literally EVERY day at the pool! I used to love to swim. Would like to get back to jt.